The Recipe: Just in time for Cinco de Mayo (Friday! ), Derby Day (Saturday! ), Mother's Day or your next summer Mexican fling, a super-easy homemade Margarita Pie that tastes just like a very good margarita! Really, it does! That's thanks to a not-so "secret" ingredient found in every single kitchen. Yep, I'm still in #PieDayFriday mode! On Father's Day, it'll be an entire year that I've made a pie every Friday. No surprise, I still love it! And I'm still learning! Still, odds were high that Dad and Jerry would like this Easy Margarita Pie: they're partial to creamy pies like Lemon Meringue Pie and Banana Cream Pie and Blueberry Cheesecake Pie. What Makes an Easy Margarita Pie Taste Like a Margarita? So the biggest surprise with Easy Margarita Pie is how much it tastes like a frosty margarita on your favorite summer patio! That's thanks to one very surprising "secret" ingredient. Can you guess? Lime juice and orange juice, maybe? Sure, the fresh citrus gives the pie margarita fruitiness. But it's not the defining ingredient. The tequila, maybe? Nope, not the tequila either. The single key ingredient, one found in both the filling and the topping that makes Easy Margarita Pie taste like a margarita? Salt. Yes. Salt. Don't skip the salt! How Much Juice In a Lime, Anyway? Speaking of limes, arrrgh, it's so hard to estimate how many limes are needed to produce enough lime juice for a pie. Experience says that here in the Midwest, anyway, a Persian lime (that's the only lime we see, except for the even less predictable and less findable key limes) yields about a tablespoon of freshly squeezed lime juice. Every so often, one will yield as much as two tablespoons but more often, a lime will squeeze out as little as a half tablespoon. The lesson? Do buy extra limes, then get your squeeze on! By the way, over the years, I've tried all kinds of citrus juicers, finally ending back where I started with my grandmother's oh-so-pretty green glass citrus reamer. Someday I'll write a post going through all those lemon devices, definite disappointments, all. But not Gramma's antique juicer! EASY MARGARITA PIE IS BAKED! First, how the egg-based filling gets cooked. Usually, with this style of creamy pie, the filling is cooked on the stovetop. Translation: that involves the fussy process of tempering the eggs and cooking the filing to the perfect point where, later, once it's cooled, the filling will set up. Arrrgh, how often can one end up with soupy pie after mid-judging that perfect point? Make pie every week, you'll learn, it's all too often! But here? The filling is quickly whisk-whisk-whisked in a bowl, no mixer required. Then it's turned into a graham cracker crust and slipped into the oven. So easy! The "cook the pie filling in the crust in the oven" is a trademark technique of the pie recipes from First Prize Pies: Shoo-Fly, Candy Apple, and Other Deliciously Inventive Pies for Every Week of the Year (and More) by Allison Kave, pastry chef and co-proprietor of the Brooklyn bar and bakery combo, Butter and Scotch. 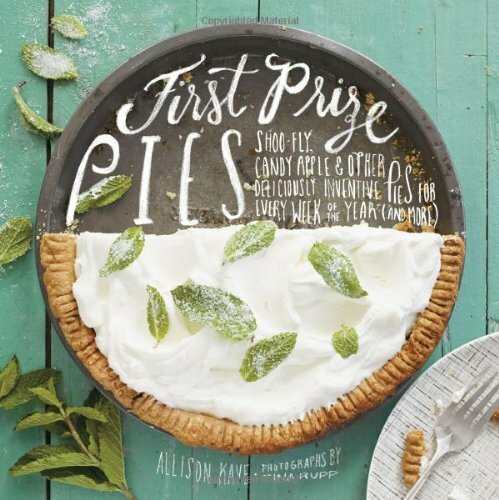 Now don't cross your eyes about all that chef/restaurant business because First Prize Pies is the least chef-y and least restaurant-y pie cookbook out there right now. I know: I've poured over a LOT of pie cookbooks in the last year. Despite its culinary pro + restaurant underpinnings, First Prize Pies is very home-cook friendly. In fact? I borrowed a dozen pie cookbooks from the library. First Prize Pies is the only one I decided to purchase. THAT WHIPPED CREAM TOPPING Second, the topping is gorgeous whipped cream. Now, Easy Margarita Pie is no "diet" pie but here's one thing I've learned in the last year of baking a pie every week: a half cup of cream, whipped, is plenty ample when you spread it across the pie's center, leaving the filling exposed along the outer edge. And besides, don't you love that look?! I love a pie that hints at what's inside! First Prize Pies recommends, wow, a whole cup and a half of cream. To my taste, that would totally overwhelm that gorgeous sweet 'n' sour margarita filling underneath, to say nothing of adding a kazillion unnecessary calories. FILLING In a large bowl, whisk the eggs, sugar, sour cream, zest and salt until fully combined. A splash at a time, whisk in the lime juice, orange juice and tequila. Pour Filling into prepared Crust. BAKE Place the filled pie shell onto a baking sheet and bake for about 30 minutes; start checking at 25 minutes (and every 5 minutes afterward), the filling should be slightly jiggly in the center but should no longer "slosh". Remove the pie from the oven and let it cool at room temperature until, well, room temperature. TOPPING Once the pie is cooled down, whip the cream, sour cream, sugar and salt until pillowy. Spread across the pie's center, leaving the outer edge revealed. Sprinkle with lime zest. TO SERVE Cut slices with a slim knife. The pie would be really pretty with a few strawberries or blueberries or a thin slice of lime on the plate! MAKE-AHEAD Do allow time to cool the pie down after it's out of the oven, also to chill the pie for a good two hours for it to fully set up. It's "best" eaten on the same day but the leftovers definitely taste good, they just don't look as pretty. Importantly, this is one of the few pies in my collection which can be made mid-afternoon, say, to serve for dinner. Mostly, homemade pies should be started early in the day, even the day before. ALANNA's TIPS That's right, no need to get out the mixer for this pie! A whisk works just beautifully. I wondered how an already-baked graham cracker crust would turn out after being filled and spending another 30 minutes or so in the oven. At least with a homemade crust? No problem! In addition, I "think" but haven't tried – that you could put this filling into an unbaked graham cracker crust, then bake the pie. I've learned to welcome the assistance of a baking sheet when making pies. For blind-baking pastry crusts or getting golden color on the bottom of a pie that's baked a long while, I put the baking sheet into the oven while it heats up, then put the pie pan right onto the baking sheet. Here, however, the point of the baking sheet is to provide "sloshing space" (just in case the filling sloshes out a little as it moves toward the oven) and to help the pie bake more evenly. I love-love using the whisk attachment to make a small amount of whipped cream. I measure the cream right into the mixing cup that comes with the set, then whip away. So easy! Could you use a can of whipped cream? Yep! Even easier! Hi Alanna - I lost track of your blog, but then I lost track of my mom's "Guh-nocchi" recipe and remembered you had it (Cheese Gnocchi Pie), so tracked back here. Thanks for all you do! A comment about Margarita Pie - my trusty old (ca. 1980s) recipe from Texas called for a crust made with 1.25 cups crushed salty pretzels, 10 Tbsp melted butter, and 1/4 c sugar, combined and pressed into pie plate. That gets you the salty base! Then the pie was sweetened condensed milk etc., yours sounds better!